How does a white LED work? An LED is a Light Emitting Diode, and is a semi-conductor device which will glow if you pass a current through it. A semi-conductor is a material which in it's natural state won't conduct electricity well, but if you add tiny quantities of other materials it will conduct quite well. Normally each atom in the semi-conductor has 4 electrons and there are none free, but if you add a few atoms with 5 electrons there are some extra electrons which can move easily and carry a current (an N-type semi-conductor). Similarly if you add some atoms with only 3 electrons and then you get some gaps which other electrons can move into (a P-type semi-conductor). The electrons can now move a bit like the tiles in a sliding tile puzzle, but it is easier to think of a positively charged hole moving through the semiconductor. N-type with a few extra electrons to carry currentP-type which has a few electrons missing which can be thought of as positively charged 'holes' and can carry current. .A diode is made if you join a lump of P-type semi-conductor to a lump of N-type. If you make the N-type region negative and the P-type positive, electrons and holes will move towards the junction and there are plenty of charge carriers there and a current can flow. But if you make the N-type region positive and the P-type negative then electrons and holes will be pulled away from the junction leaving the junction with nothing to carry current, so it becomes insulating and a no current can flow. Electrons and holes are pushed towards the junction so a current can flow.Electrons and holes are pulled away from the junction leaving it insulating. So what has this got to do with LEDs? if a current is flowing through the diode, you will get both electrons and holes in the same part of semi-conductor, this means that they can meet. When they do the electron can fill in the hole, releasing some energy, In an LED this is in the form of light. 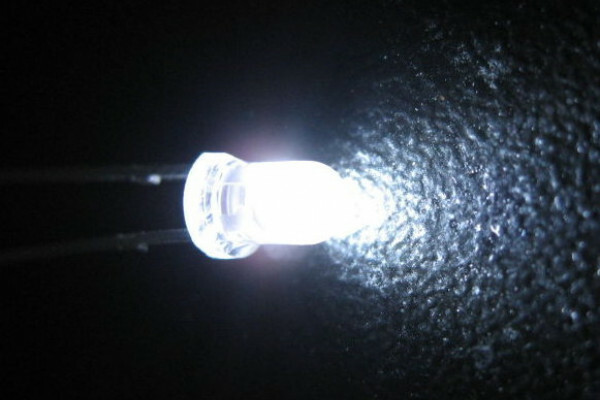 The energy and therefore the colour of this light is fixed by the type of semi-conductor you are using, so normally it is all one colour, this is why LEDs are traditionally coloured. In fact it is much easier to make LEDs at the red end of the spectrum than the blue which is why blue LEDs have only recently become common. White light is of course a mixture of colours and if you were to use LEDs on their own you would need 3 LEDs to make white light. Manufacturers have a cunning way around this problem, they use phosphors, these convert high energy blue light into lower energy colours such as red, yellow and green. So by covering your LED with phosphors a blue LED can appear white. Previous Why are yawns catching? Next Why did my light work when soaked? Why does meat change colour when it's cooked?